Disasters are a growing threat, affecting more people and doing more damage than ever before. Their impact is especially devastating in countries with high levels of material poverty; the Least Developed Countries accounted for 40 per cent of all deaths from natural hazards between 2000 and 2010, despite having only 12 per cent of the global population. Over the coming century, climate change is likely to increase the frequency and severity of floods and droughts in many parts of the world. 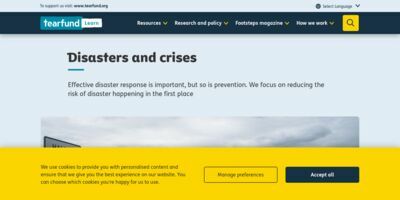 Tearfund does not believe that disasters are a ‘humanitarian’ issue which can be separated from development work. Entrenched poverty is both a cause and consequence of disasters; decades of incremental victories against poverty can easily be reversed in a single catastrophic event. To be serious about transforming lives, health, livelihoods and infrastructure in vulnerable communities, a comprehensive approach is required which integrates poverty relief with plans for effective disaster response and long-term disaster risk reduction.